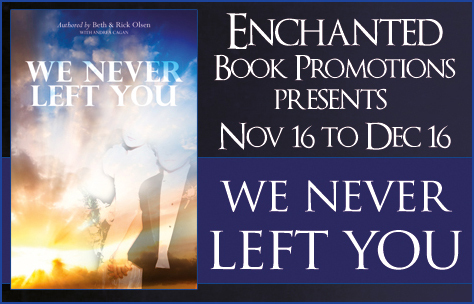 I’m hosting a guest post today for the tour for “We Never Left You”. I’ll leave the word to Beth and Rick Olsen now. 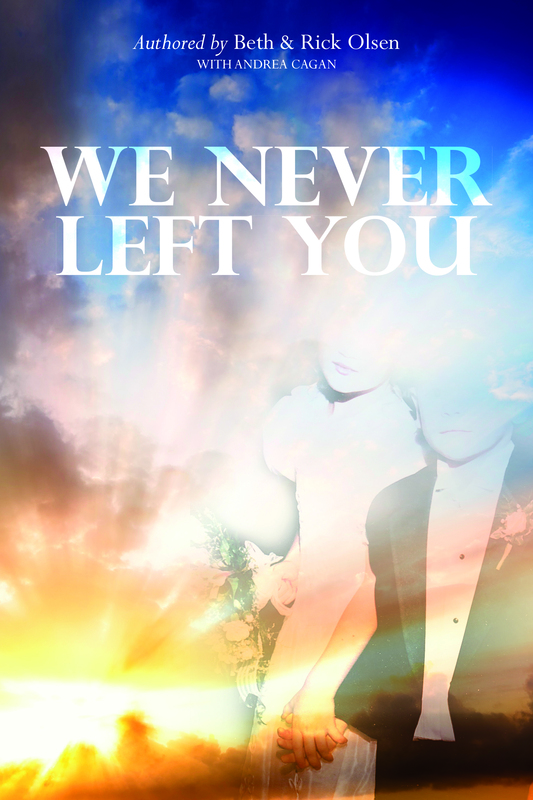 We Never Left You. That is the title of our book and the story and hope of our life. Our nine year old daughter Jessica and seven year old son Joshua were killed on July 18, 1999 in an accident involving a drunk driver on a Sunday afternoon. How do you go on is the question that we heard many times. At first we had no idea. We had to learn just how to get through the next five minutes. But how could we get beyond those five minutes? Our children, the heart and soul of our family were gone. Life took over at that point. Our bodies told us we had to eat. We had to sleep. We had to use the bathroom. Life also told us we had to take care of details that we never dreamed we would have to. We went to the funeral home to talk about how we wanted our children’s funeral arranged. We stared at him in stunned silence. “What did you say?” Beth asked. He repeated it again. We had a glimmer of hope that maybe; just maybe our children were alright. We were just given our introduction to the fact that our kids have never left us. The following morning we were given confirmation that they never left us. We were visiting a friend of ours before the funeral. She was a gifted psychic. We chatted with her for over an hour and as we were about to leave she said, “The children are here, no wait it is only Jessica.” Our friend got that far off look in her eyes, as if she was listening to something only she could hear. She gave us a message from Jessica. The message was about a conversation that Beth and Josh had an hour before the accident concerning a chicken in the basket. Nobody else knew about the conversation except for Beth and Josh. Tears rolled from our eyes as hope began to creep into our hearts. Our children were reaching out to us. As we were leaving our friend told us that the kids were arranging something for us when we got into the car. Not sure what to expect, we waited excitedly in the car for several minutes. When nothing happened we started up the car and there it was. The children’s favorite song from the movie Tarzan was playing on the radio. The song was titled, “Two Worlds, One Family.” We smiled and wondered, if our children were gone then how are these things possible? As time moved on we had no choice but to move on as well. We began to piece together our shattered lives. The loss and heartbreak was still unbearable. Our children continued to send us messages to let us know they were still with us. We began a journey to figure out how to communicate with our children. As we moved along that journey the seeds of healing were being planted. We began to share the chicken in the basket story. Whenever we did we saw the power of that story. It gave hope and healing to some and peace to others. We began to understand that this story needed to be told. A slow realization began to creep over us. If this story needed to be told, could it be possible that the accident and the kids communication with us was meant to happen? 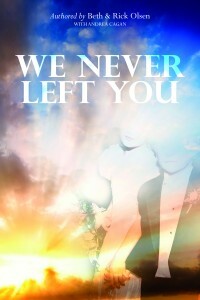 After unspeakable tragedy, one couple must forge their own path to healing in the bittersweet true story, We Never Left You. 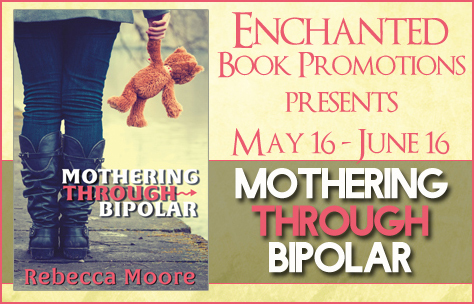 One moment, Beth and Rick Olsen were enjoying an ordinary life filled with all the joys and frustrations of raising their two children, Jessica and Joshua. The next moment, a drunk driver plowed through a red light at eighty miles per hour, hitting their van and changing everything. 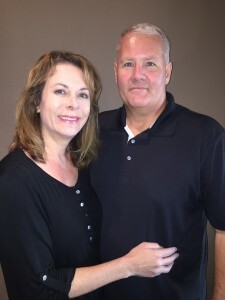 The death of both their children launched Beth and Rick down a long and winding path toward simple survival—and eventual healing. As shock gave way to the cruel reality of their loss, they began receiving messages that proved the existence of life after death—a welcome sign that aided them in moving forward. The Olsens soon attempted traditional healing methods but quickly found that counseling did nothing to help them get a grasp on their monumental loss. They then turned to nontraditional approaches—a decision that led them to Peru. It was there they finally began to undergo the immense physical, mental, and emotional changes that allowed them to understand everything—including the accident—happens for a reason. Happily married since 1987, Rick and Beth Olsen survived the death of their two children from a drunk driver in 1999. 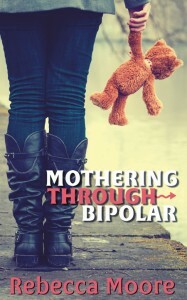 Now, in 2015, they have written their first book about their experiences in an attempt to help other people undergoing the same kind of tragedy. Beth and Rick live in Glenbeulah, Wisconsin with their three children. Andrea Cagan has been writing, ghost writing, collaborating and editing for over two decades, with more than a dozen books appearing on the best seller lists, including four #1 NY Times and LA Times best sellers. She focuses on topics of social value, and has worked with such celebrities as Magic Johnson, Marianne Williamson, Grace Slick and many more. 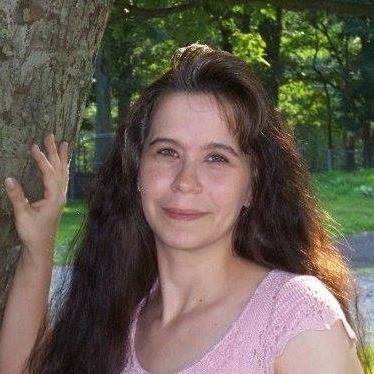 My body and mind were attuned to Deloris’s smallest movements; I would be wide-awake within seconds whenever I sensed Deloris needed help. If Deloris slept on the first floor, there was no place for me to sleep next to her. Nor did I want to pay a caregiver to sit in a chair beside my wife in order to help her to and from the bathroom a couple of times a night. The stairs were not wide enough for a standard chair lift; a customized chair lift was too expensive. Major house renovations would take time, even if they were possible, practical, and affordable. No option that involved staying in our present house seemed feasible. The clock was ticking, and it scared the hell out of me. I needed to fix the problem and had no idea how. I looked around and was surprised by what I saw. “That could work,” I said. While not ideal from a decorator’s standpoint, the solution entailed minimal inconvenience. We would no longer have a functional living room, but it was a lot easier, and less expensive, than moving. And if we bought a new bed, we could move our present one into the empty room upstairs and have a real guest room. As a teacher of critical thinking, I was familiar with how our strong feelings can cloud our thought processes. I had been caught up in my own emotional maelstrom and could neither recognize it for what it was nor find a means to escape it. I had needed another pair of eyes, someone uninvolved who could look at things dispassionately and come up with a rational, workable solution. Ben’s suggestion excited me on several levels. We could remain in our home, and I would now have new material for my classes: a personal example of how a dispassionate party can help in problem solving. Allan and Deloris Ament’s lives take a dramatic turn when Deloris suffers a debilitating stroke. No longer an equal partner in marriage, Allan becomes Deloris’s primary caregiver, responsible for maintaining their household and her well-being. 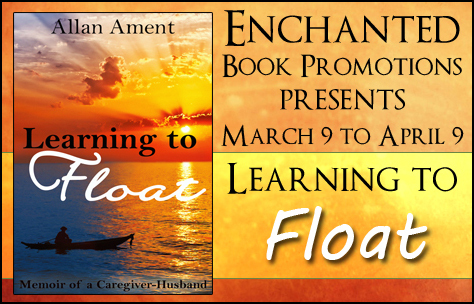 Learning to Float describes Allan’s transformation from a criminal defense attorney to a compassionate, emotionally vulnerable caregiver. Drawing on contemporaneously written emails and private journal entries, Ament unflinchingly exposes his emotional, mental, and physical ups and downs, consistently focusing on the love, humor, and opportunities for personal and spiritual growth he experiences on this journey. Anyone with the possibility of becoming a caregiver for a loved one, now or in the future, will benefit from the insights Ament shares. Everyone will be buoyed by the love Allan and Deloris experience as they face their new normal. After successful careers as a criminal defense attorney, higher education administrator and instructor, and day spa manager, Allan Ament now enjoys retirement with his wife, an award-winning journalist and author, and their semi-neurotic cat (are there other kinds?) They live on an island in Puget Sound, north of Seattle, where, in addition to writing and being his wife’s primary caregiver, Ament serves as board chair for the Northwest Institute of Literary Arts (nila.edu). 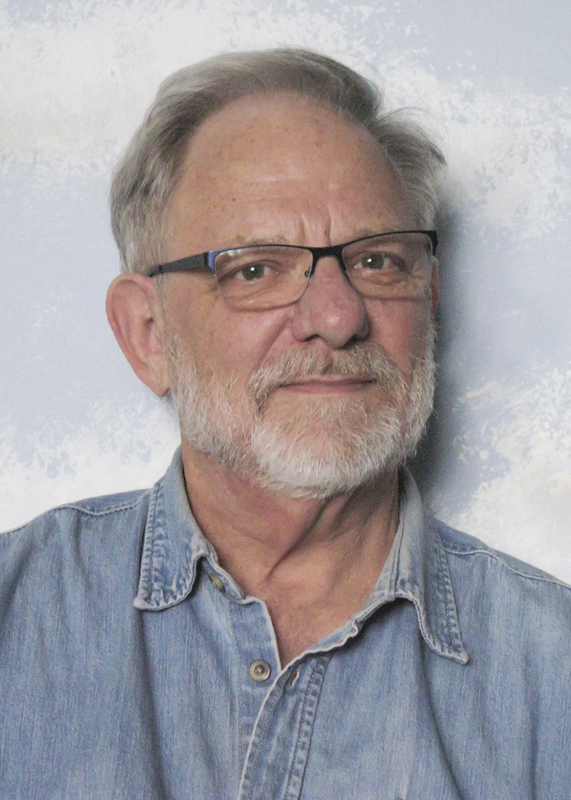 His work has previously appeared in academic, professional, and literary journals, and is included in an upcoming anthology, Being: What Makes a Man. 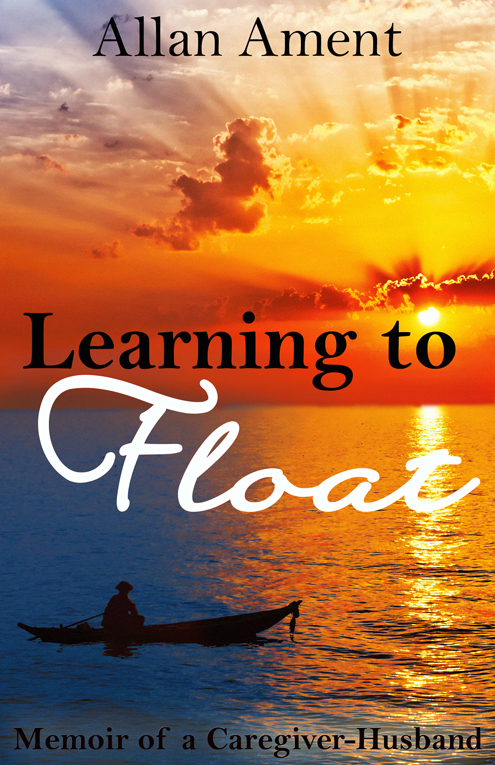 Learning to Float is his first book-length work. Win a signed paperback copy of the book along with a Whidbey Island, WA goodie basket with bonus Seattle coffee and mug. 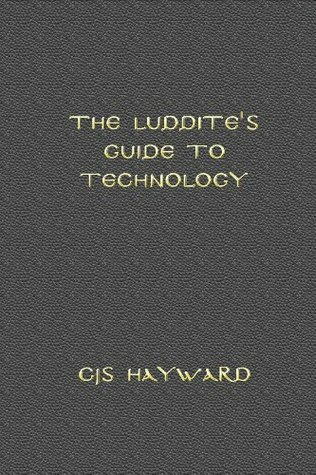 I’m interviewing CJS Hayward, author of creative non-fiction “The Luddite’s Guide to Technology”. Welcome to my blog! 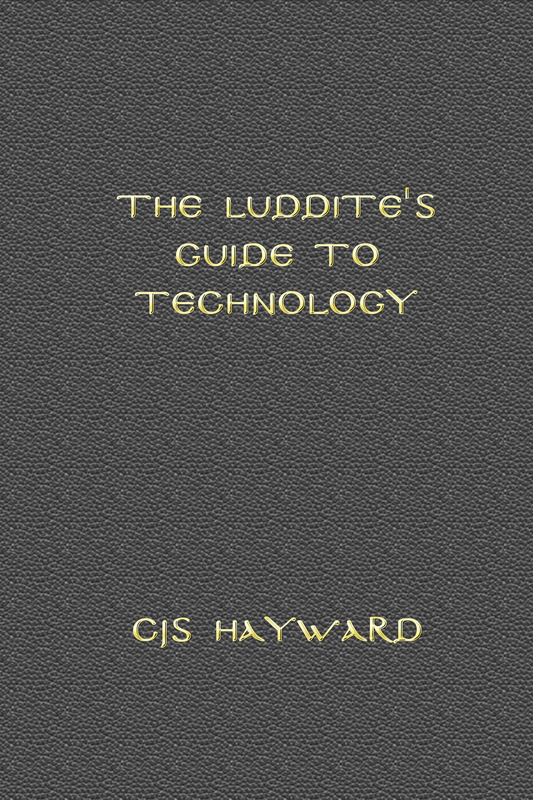 2) Is The Luddite’s Guide to Technology your first book? If not, please tell us a little about your first book. 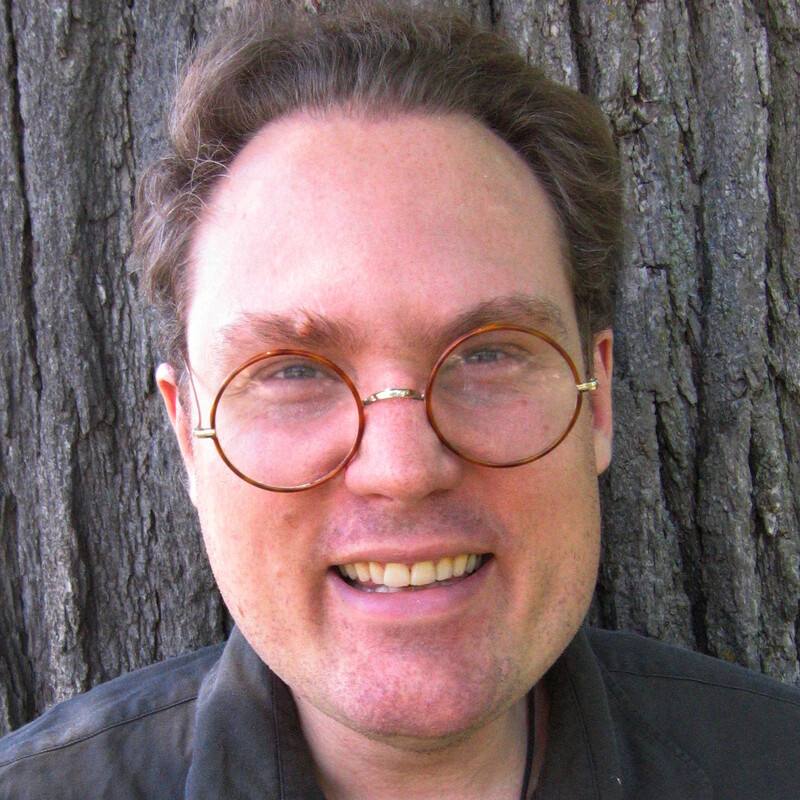 ​Exactly pinning down my first book is hard; I took, years back, my writing and divided it into seven books: The Steel Orb, Hayward’s Unabridged Dictionary, The Christmas Tales, Firestorm 2034, Yonder, A Cord of Seven Strands, and The Sign of the Grail.​ If we table the question of “first to market”, my “best to market” was probably The Best of Jonathan’s Corner. The Best of Jonathan’s Corner is a well-rounded collection about faith, religion and spirituality. 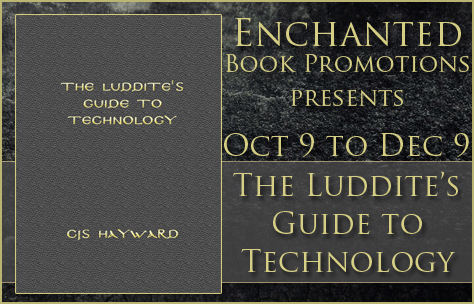 3) Why did you choose to write about technology? ​I would like to write something about Merlin, but it is coming in fits and starts. If you visit my website,​ there is a great deal that is already there and already written. Mammon, as it is challenged in the Sermon on the Mount, represents such wealth and possessions as one could have two thousand years ago. But that is merely beer as contrasted to the eighty proof whisky our day has concocted. The Sermon on the Mount aims to put us in the driver’s seat and not what you could possess in ancient times, and if the Sermon on the Mount says something about metaphorical beer, perhaps there are implications for an age where something more like eighty proof whisky is all around us. 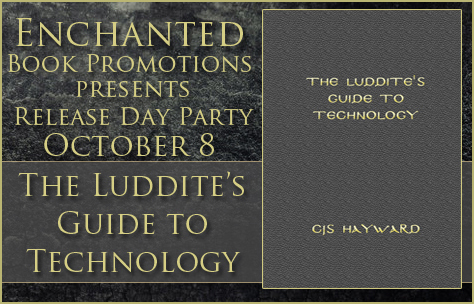 I’m hosting an excerpt today from creative non-fiction, religion and spirituality book “The Luddite’s Guide to Technology”. I hope you enjoy this excerpt. This excerpt comes from the essay with the same name as the book’s title. Donald Knuth, one of the leading lights in computer science, got rid of his email address well over ​a decade ​ago. He said that email was good for being on top of the world, and what he wanted was to be at the bottom of the world and do research. In other words, he had certain goals, and he found that email was not a helpful luxury in reaching those goals. 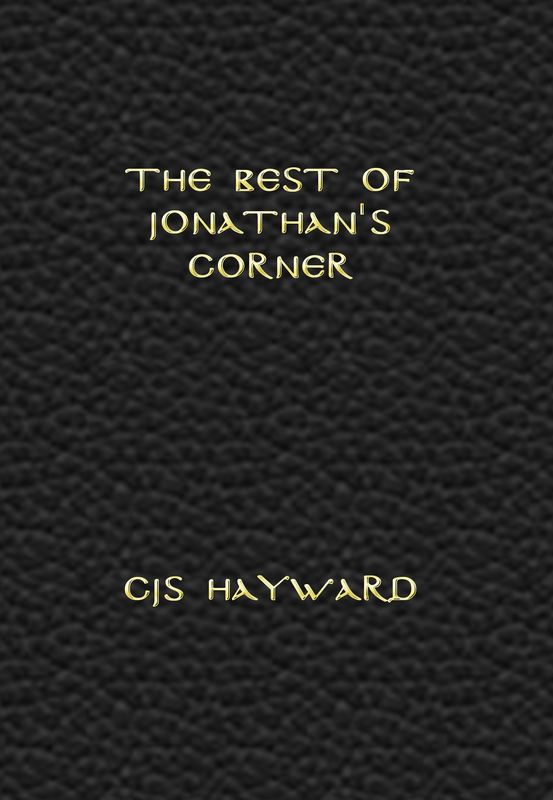 I wanted to read The Best of Jonathan’s Corner mainly because I’ve always been intrigued by mystical theology, yet I know little about it. I especially enjoyed the pieces talking about economy, like “Money”, since even for a non-Eastern Orthodox person, o who has not been raised in such a tradition, valid points are raised in these pieces. What I liked as well is that one does not have to read all articles – it’s perfectly acceptable to skip one, or to move on to those articles of interest. My favorite pieces of the collection were those dealing with religion vs. science, as I find that discussion intriguing, and the other makes some solid arguments.